When a home is constructed with beautiful woodwork, the finish of the wood is normally not painted but left natural to some degree. Some homeowners prefer to let the exterior timber weather naturally, while others want to delay the weathered look as long as possible. A timber finish of curing oil with UV absorbents will need to be maintained more often, and the weathering occurs quicker. 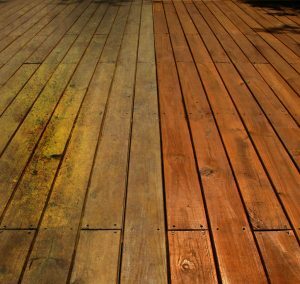 To delay natural weathering of the timber, a stain finish is applied but must be carefully chosen to match the original color of the species. Maintenance is less frequent for stained finishes. Here are some tips from our experts at Fusion Painting in Canberra, Australia. The preservation of timber is important here due to our climate. The timber in and on the exterior of a home is an investment. To preserve it as long as possible, professional timber finishing will always give you the best results over an amateur finish. In timber finishing, there are many aspects involved which are important to achieve good results. One of the first important aspects of timber finishing in Canberra is to know everything there is to know about the wood species. The properties of the wood to be finished and the finishing system used determine the outcome. For instance sapwood and heartwood need a preliminary stain so color variation is reduced. Oak and other hardwoods with porous rings are better filled before finishing so the pores are bridged and the wood is resistant to cracking. The wood’s moisture content also affects the stained finish. And the tropical timber rosewood, cocobolo, and African padauk shouldn’t be cured with unsaturated polyester or UV acrylate coatings because they contain exractives like quinones within the wood. Another important part of the timber finishing process is to know the types of finishes used before trying to use them. Evaporative finishes – An evaporative finish evaporates with a residue left over. Wax is such a finish because it is dissolved in a petroleum distillate or turpentine to create a soft paste. Reactive finishes – A base such as white spirits and naphtha are used. A reactive finish changes when it cures, not like evaporative finishes. Such finishes are varnishes, tung oil, or linseed oil. Coalescing finishes – They are a combination of reactive finishes and evaporative finishes. A water based finish is a coalescing finish. Timber finishing is both an art and a science. There is a world of information to learn about the different finishing techniques, how to apply them, and what results they achieve. With this basic information, the foundation of understanding the process of timber finishing are outlined. There is much more to learn.